The money is collected as $136 fines whenever a driver passes a camera-equipped intersection, after the light turns red. Currently, all school-zone cameras income and 20 percent of red-light cameras income goes to school-safety projects. 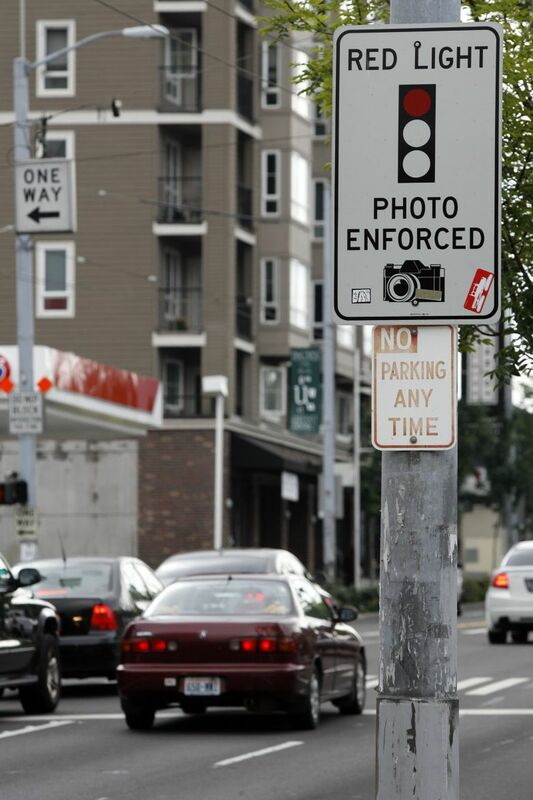 The Seattle City Council is poised to shift about $900,000 per year in red-light camera income away from school sidewalk and crosswalk projects, and into the general fund. Councilmember Sally Bagshaw, who chairs the budget committee, argues the school-safety projects would remain fully funded, because the city’s enforcement cameras in 20 mph school zones are raising more money than anticipated when Mayor Jenny Durkan proposed her budget in September. The money is collected as $136 fines whenever a driver passes a camera-equipped intersection, after the light turns red. Currently, all school-zone camera income and 20 percent of red-light camera income goes to school-safety projects, while 80 percent of red-light income flows into the general fund. With the change, 100 percent of the red-light money would go to the general fund, as it did before 2016. Under Bagshaw’s plan, red-light income collected in 2018, 2019 and 2020 would be diverted from Safe Routes to School projects, allowing the council to spend $2.7 million on other priorities. To add money for dozens of programs related to arts, parks, homelessness and other needs, the council has had to scrounge from elsewhere. The red-light transfer is among the largest in a package of budget actions the council intends to make before passing Durkan’s budget this month. “I looked for places in the existing budget where revenues generated were higher than expected. School-zone cameras was one such place,” Bagshaw said Friday. School-area projects would still see more money under her plan than they were allocated in Durkan’s budget, the council member said. “Cameras in school zones were installed largely to help calm traffic in places where kids and cars are at risk of colliding. Instead, drivers continue to speed through school zones and citations are issued. As a result the city has more dollars in the dedicated account than anticipated,” Bagshaw said. On the other hand, Greenways executive director Gordon Padelford said that if more people are speeding, that’s a problem in its own right — which actually shows a need to move faster on safety projects. Padelford said his group is collaborating with four elementary schools of high need and low income, that are scheduled for projects soon — Broadview-Thomson K-8 along busy Greenwood Avenue North; Emerson Elementary uphill from Rainier Beach; Sacajawea Elementary in the Maple Leaf neighborhood near Northgate; and Wing Luke Elementary on south Beacon Hill. Councilmember Mike O’Brien says he didn’t hear about the plan to transfer the red-light money until Wednesday and now is torn about what to do. O’Brien understands why pedestrian advocates want red-light money to be spent near schools, but he also doesn’t want to pull back on key budget adds that the dollars would help cover, he said. O’Brien said the council should have discussed the red-light shift weeks ago and allowed members of the public to weigh in, rather than set up a duel between school-safety needs and other programs at the last minute. “That’s a losing proposition for everyone,” he said. Safe-streets activists played a major role in passing the nine-year, $930 million Move Seattle levy in 2015, when then-Mayor Ed Murray promised every Seattle school would gain safer walking routes by 2024. The Durkan administration declared a “reset” on the levy this year, admitting that construction inflation and unrealistic estimates would slow projects such as bus lanes. However, the Seattle Department of Transportation still expects to improve 32 school zones in 2019, and SDOT has stayed on pace with its levy schedule for school routes, said spokeswoman Mafara Hobson. Former Mayor Mike McGinn, who used camera-citation windfalls to accelerate the program in 2013, said he hopes exposure of the 20 percent diversion causes such a backlash that the city moves 100 percent of the red-light income to funding safer streets. “I’m pretty sure there are other places in the council and mayor budgets to find savings. Don’t do it on the backs of children walking to school,” he said. State law allows automated speed-enforcement cameras only in school zones, where Seattle’s income after expenses declined from $13.2 million in 2016, to $11.3 million in 2017, a projected $9.8 million for 2018, and $8.5 million next year, according to Durkan’s budget. The mayor said last month the city will seek a new state law to extend camera enforcement, to keep cars out of bus-only lanes. Seattle is a signatory to a national Vision Zero coalition, in which the city aspires to eliminate traffic casualties by 2030. Vic Bishop, treasurer of the Washington State Good Roads & Transportation Association, offers a different rationale for why red-light camera income shouldn’t go to Seattle’s general fund. “The critics of red light cameras think it’s a cash cow for local agencies, but the drivers pretty much think, if I get a speeding ticket, it’s going back into roads,” Bishop said. Just as the state’s 18th Amendment earmarks gasoline tax revenue to road funds, the camera-enforcement dollars are also a user fee that should go into street projects, he said.